Flashback was published in 2015. 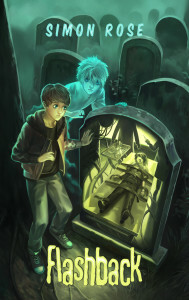 It’s a paranormal mystery adventure for young adults featuring ghosts, psychics, and Project Mindstorm, a secret operation involving deadly mind control experiments, as Max investigates events concealed for over twenty years. The initial idea was one of the first that I had when I began my writing career but the novel took a while to develop to my satisfaction. In Flashback, Max, a fourteen-year old boy, experiences strange dreams and visions, which appear to be from someone else’s life. He also sees a ghost and fears that he might be losing his mind. However, following an encounter with elderly private detective John Carrington, Max learns of government conspiracies, secret kidnappings, and mind control experiments conducted by a rogue scientist and his psychic accomplice. 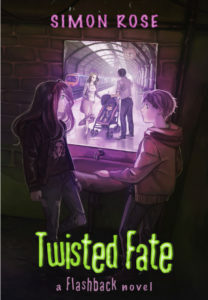 Twisted Fate is the second part of the paranormal trilogy and the story begins around the time of Max’s fifteenth birthday when he receives a box of personal items that once belonged to his mother and soon begins to have strange dreams and experience disturbing visions. Max steadilylearns the shocking truth about his mother and her possible connection to Project Mindstorm. Max also meets Julia, a girl with dark hidden secrets, as he attempts to alter his mother’s fate and his own, for better or worse. He and Julia embark on a seemingly impossible mission involving deadly psychics, paranormal phenomena, and multiple shifting timelines. On the run and pursued at every turn by the powerful and ruthless Kane, Max and Julia engage in a desperate race against time in an attempt to save countless lives and transform their own destiny. In Parallel Destiny, the third part of the trilogy, Project Mindstorm no longer exists and Kane and his associates no longer represent a danger. However, Max and Julia now have to contend with the sinister Alastair Hammond and his experiments into the existence of parallel universes and alternate realities. Marooned within a bewildering series of multiple universes, Max and Julia are forced to fight for their own survival and to save the very fabric of reality from Hammond’s deadly scheme. Flashback was originally a single novel but more or less as soon as it was published I realized that there was more to the story. My father also read Flashback and asked when the next one was coming out. I thought that he was referring to my next novel but he meant the next paranormal adventure and pointed out several areas in Flashback where there were opportunities for more stories. There were also some unanswered questions so I got to work on a further installment. While writing Twisted Fate I knew that there was a third story and had an idea for a novel involving parallel universes that I realized would be a perfect fit to wrap up Max’s adventures. 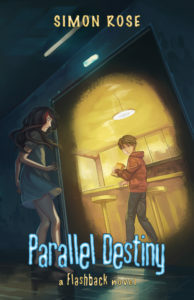 The third part of the trilogy, entitled Parallel Destiny, will be published early next year.